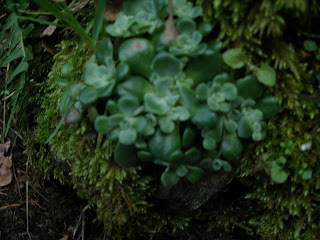 Stonecrop Sedum species can be found on rocky hillsides just as the name implies. 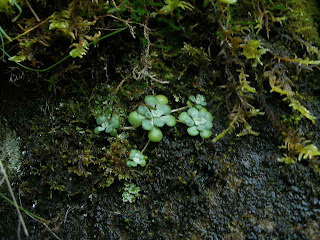 The common species here in the Pacific Northwest is Broad leafed sedum spathulifolim and Creamy Sedum oregonense both look similar, the one above is Creamy Stonecrop. Most of the leaves are light to medium green in color, some outer leaves may be red, these are the older leaves. 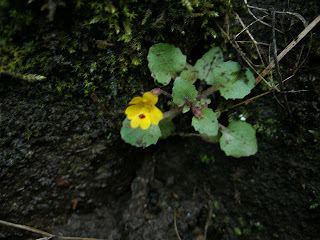 Later in the season around May or June the plant will send up a shoot of yellow little star shaped flowers, they look beautiful against the rock face. 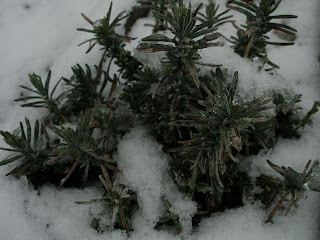 In the snow you can look for the dried shoots against hillsides & find the plant underneath, it will stay juicy throughout winter. 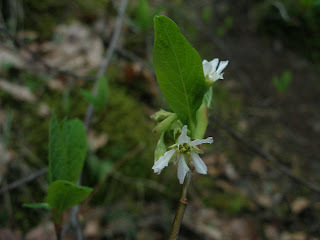 The entire plant is edible, and would be great in a survival situation, or as a trail food. It would make an interesting addition to a wild food salad. It tastes bland, slightly like a cucumber. 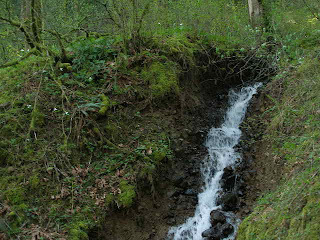 If your throat is dry from a long day of hiking, the Stonecrops muciaginous and juicy nature is very soothing. The plant is slightly astringent & muscilaginous. 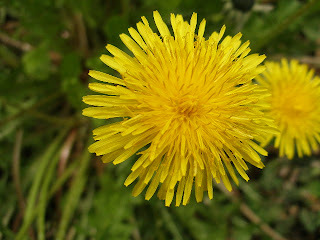 It can be used for externally for cuts, scrapes, stings and minor burns, making it very useful as a field remedy. Break apart a leaf and apply it directly to the effected area as needed. Native Americans used a decoction of the root for sore throats and eye irritations. The roots are creeping rhizomes or stolons (roots that creep above ground). 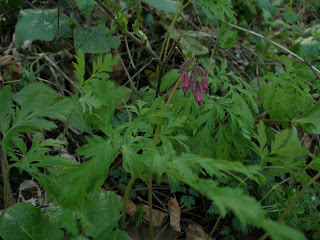 A few Bleedinghearts dicentra formosa are showing their blooms early. Bleedingheart is one of the first plants I remember my Grandpa & Grandma pointing out to me as a child. The unique shape of the flowers made it an easy plant for me to identify. Bleedingheart likes moist soil and is common on the foothills of the mountains here in the Pacific Northwest. 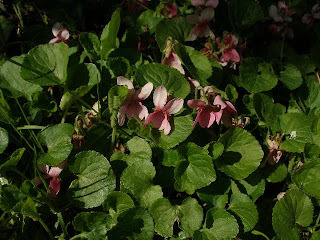 The flowers range from pale to deep pink. The leaves resemble ferns and are just beautiful. When crushed, the bleedingheart smells a little like poppy, they are in separate families but are pretty closely related. Bleedingheart is one of the plants I want to practice with more this year. I felt a strong attraction to it recently, my mother suffering from an undiagnosed autoimmune condition they think may be fibromyagia or polymyalgia rheumatica.When her symptoms got worse and she was having to take more pain medication, this plant kept coming into the forefront of my mind. She is getting of the medication, I am thinking this plant will be an excellent asset for her. 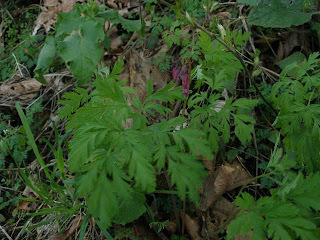 uses bleedingheart frequently both for himself and in his herbal practice. When I asked Chuck for his thoughts on bleedingheart he replied enthusiastically that he absolutely loves the plant. I wanted to share some of his insight. 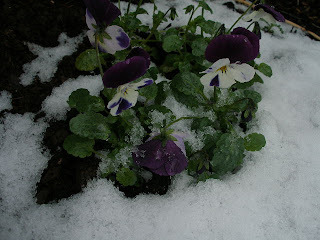 I plan on working with the plant more, look for more from me to come in future blog posts. Chuck prefers using and making a fresh root tincture 1 to 2, in 150 rum, using anywhere from 10 to 30 drops. Internally he has found it effective for the aftermath of accidents, attacks, trauma, especially if the after effect is a continued racing heart or the beginning of an asthma attack. It can be useful for quickly induced depression caused by the former. It breaks the cycle of grief-shock, and allows the person to function. He has used it on himself when his mother suddenly passed away and he was barely able to function the week before her funeral. It can also be used for the type of trauma that causes the body to have hyper sensitivity. Clothes feel like weights...and wool feels like a hair shirt. He has combined this with California Poppy tincture to help trauma victims sleep. It can also be used topically, though it may take a bit of time to kick in. Some can be put on cotton ball and inserted it around an abscessed tooth. While the root of yarrow acts much faster, Bleeding Heart goes deeper down the nerve. It can also be used on painful surgical scars as a liniment. He has found it to be a stop-gap for clients with fibromyalgia and RSDS (like himself) who have to wait for months or years to get effective narcotics legally to deal with the pain. It tends to slow down the heart a bit...so he tends to watch the effect of first time users and try to gauge how slow their heart should go. For tachycardia clients, he adds- this is a godsend. Chuck also adds that Moore writes that it is an appetite stimulant and tonic for those who are coming out of a long term illness, but he has never found it to be so. 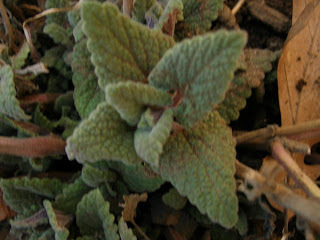 Thanks to Chuck for his wonderful incite on this awesome herb! WOW! 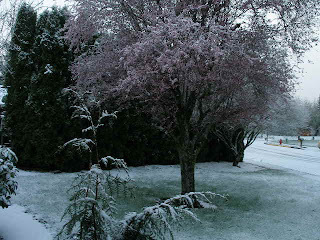 We were surprised when we woke up this morning to snow, right in the middle of spring! Koa is loving it, look how dirty he is, this will make for a great before and after shot. Last night we had a pretty nasty hail storm, some were the size of dimes. We have had some pretty interesting weather this year! Spring Greens, Shoots & Berries on the way! All of these edibles were found within walking distance of each other, around the Columbia River Gorge area of the Pacific Northwest. 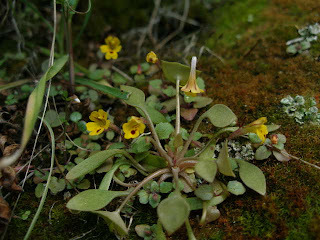 These plants are abundant in forest areas, along road sides, in yards, along edges of pastures, and local parks here in the Pacific northwest. Of course if you plan on harvesting plants please get permission and be educated about wildcrafting. 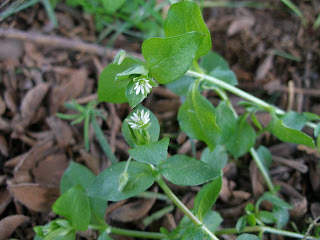 More fun ways to eat miner's lettuce. 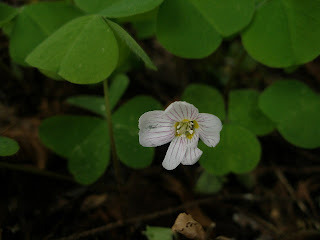 Wood Sorrel Oxalis oregana (2nd top) early in flower, the flowers here in this part of Oregon are white to pink, in other areas of the country they can be yellow. One of my favorite edibles, spreads and grows easily. I have a previous post about this here. 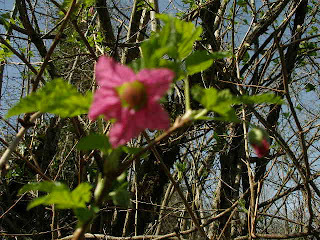 Salmon berry (3rd from top) is one of the first spring blooms. The new shoots are excellent eaten raw, just peal off the outside skin and eat the inside, you can see a picture of the shoots here. You want the new spring shoots that are growing next to the older tougher shoots that get the berries, they are usually growing directly under or near the older shoots. 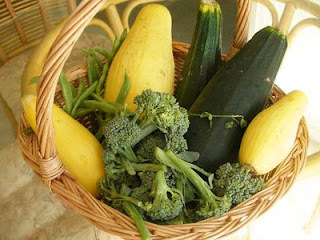 You can also add them to soups and salad.The shoots have a mild sweet flavor. 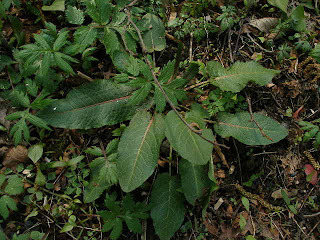 The Native Americans of the Pacific Northwest would gather the young shoots in bulk for food. Of course you can also wait for the berries. I have written about Salmon berry previously, but it is worth another mention so you don't miss the berries this year! Stinging Nettles Urtica dioica need I say more (4rd and 5th from top)? 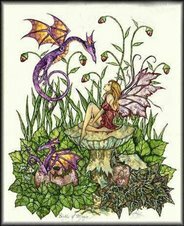 Over at learning herbs they have some excellent info on nettles, harvesting, recipes as a medicinal and more. Nettles are one of the most versatile herbs. 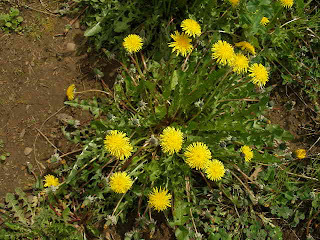 They are used as a medicinal, food, to make cloth , even the stingers are used for flogging oneself for rheumaticism and muscle/nerve type pain (herbalist jim mcdonald reports using this method in recent times with good results). The entire plant can be used medicinally including the leaf, root & seeds. 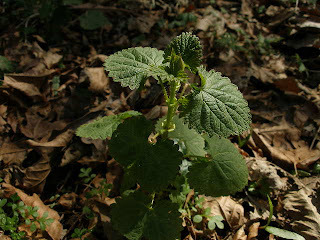 When the plant is about a foot tall (like the picture shown above), before it flowers and it gets tough, is a good time to harvest nettles for food. 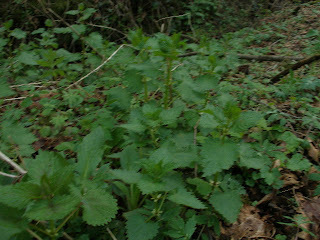 Nettles can be prepared like spinach, or drink as a tea or infusion. Wildman Steve Brill talks about ways he like to cook them here, along with some great pictures and other tips. (pictured last) The common Dock we have around here is the Yellow Dock, considered to be a common "weed". 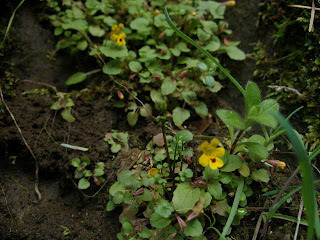 The roots are yellow and a very beneficial medicinal plant (more on yellow dock in a future post). This is a dock in it's early stages. 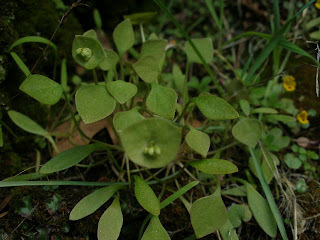 Here is an interesting recipe Fermented Curly Dock Leaves. For later in the season yellow dock crackers. 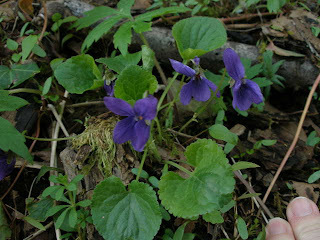 Violets are another early spring bloom. I found the blue Hookedspur violet was showing off it's beautiful blooms. 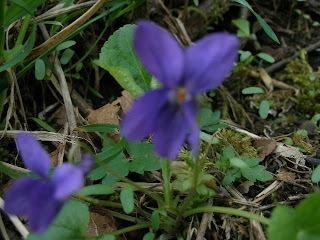 The above picture is another wild violet, I am not sure of the variety. I have heard the colors can vary. This will be a new plant to me as a medicinal. My mom brought me some over to the house that were volunteers in my Aunts yard to save them from getting sprayed, I guess they were "taking over". She knew I would like them, but she was not sure what type of plant they were. So now they have a home in my yard, and I am happy to have them! A few days later on our outing we spotted some more out in the wild, and I have been noticing them more along the road side near my home. Although this was not on my list as one of my plants to get to know this year, it seems this pretty blue violet found me! 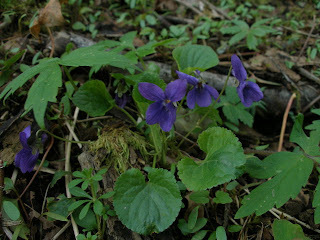 While doing some quick research online I found that wild violets have a long history of Native American uses. In reading this quick reference I found the roots and leaves were chewed during labor, hmmm that is interesting since I am in my 6th month of pregnancy ( although I have also read the rhizomes and seeds are poisonous). There are also some external applications listed for sore & swollen joints. 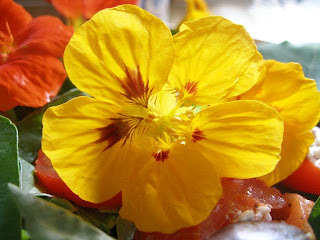 The leaves and flowers are edible and I am sure will make a pretty addition to salad. This will be an interesting plant to get to know. If you look closely you can see the little white dots next to this waterfall, they are beautiful trillium ovatum. I tried to capture the power of this place in the photo but you would just have to be here to experience it. 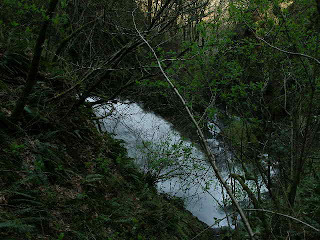 This is a water fall located at the Columbia River Gorge. I was awestruck when I saw such an abundance of trillium on this hill, beautiful and in bloom. 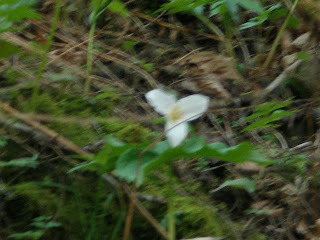 I was so appreciative that this place had been protected and the trillium could continue to thrive here. The hill they were on went straight up, someone would have to put quite a bit of effort to get to the top to disturb this trillium population. My first feeling when I saw all of these trillium was exhilaration. After that I spent some time there being completely engrossed at the presence of them. I have been familiar with trillium for several years, we even had some growing in my wild forest backyard when I was a child. 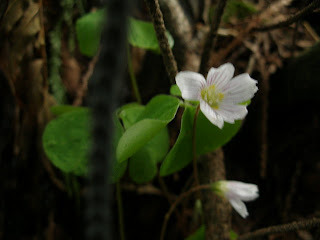 To spite being familiar with the plant, after this experience I felt a new special connection, even admiration that I had not experienced before. This area is not far from the scenic highway. Likely, many people drive by in their cars to enjoy the vastness of the scenic views here. 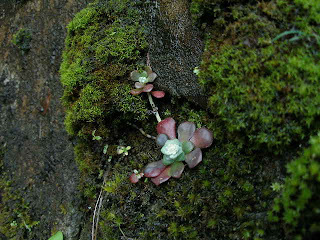 Take a closer look and you will find amazing plants like this that depend on the fragile ecosystem that surrounds them. My Mom was with me when we went on this outing. She told me she had forgotten how beautiful the plants are when you get up close. Her and her x would often go for drives here (it is called the scenic drive after all) but would rarely stop, except for at the main attractions like Multnomah Falls. I encourage everyone to get up close and personal with the earth, look closely in rock crevices, get down on your hands and knees, get connected! This place was not far from my home as a child and I have always felt a deep connection here. My hope is that this area will continue to be preserved and protected. 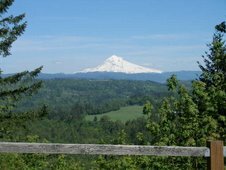 To appreciate the rarity of this plant a little more, according to Eric Jules an assistant professor of biology at Humboldt State University Trillium ovatum rarely flower prior to their 15th year. Trillium may be propagated by seed that is produced at the end of summer, plant in the fall in soil similar to a moist forest where the plants are found. 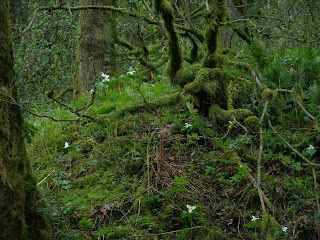 As you can see by the picture they also like to be near sword ferns and other moist forest plants. You will not see growth in the first year, and as mentioned above it will not flower for some time. I don't recommend propagating by rhizome from the wild because the plant could be disturbed. If you are able to get a rhizome from a cultivated source, be sure to ask for some of the original soil, they will require some of the microscopic fungus that comes in the soil to grow. We just finalized our house purchase, I plan on creating a sustainable garden here with local plants. Trillium will definitely be a plant I cultivate. It will surely be worth the wait. 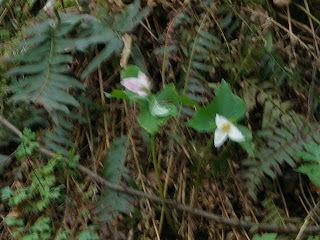 Trillium may seem abundant from the picture you see here. This is because this is a protected area. Let's help to keep this plant protected, even picking the leaves kills this plant. 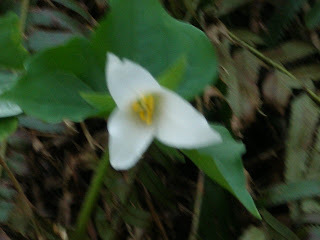 Trillium should not be collected in the wild it is protected in many states (see the prior link to learn about wildcrafting ethics, and how to find out if a plant is protected before picking), it is a plant to be respected and admired. Just sitting with the plant you can learn much from it. Other names are Bethroot, birthroot, Indian balm, & squaw root. 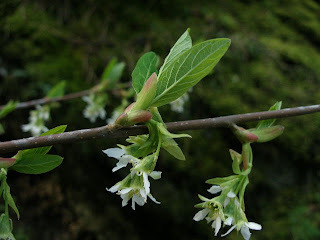 One of the first blooms I look forward to in the early spring here in the Pacific Northwest is the native Indian Plum or Oso-berry Oemleria cerasiformis. 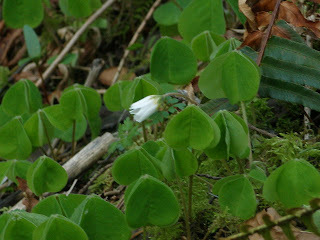 The white flowers shine through the green foliage and fill me with excitement and anticipation that spring is on the way. Poultice was chewed, the burned plant and oil was then applied to sore places. The bark was used as a mild laxative. Indian Plum grows well in moist shady places. I have seen several along roadsides up here in Sandy as well. 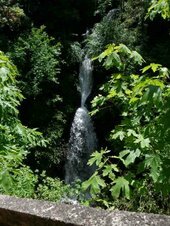 These pictures were taken by a beautiful waterfall in the Columbia River Gorge. 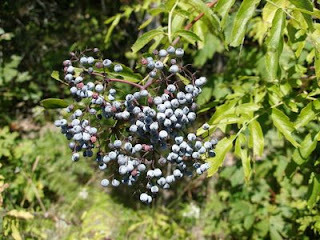 Near the Indian plum you will also likely find nettles, dock and several other medicinals. 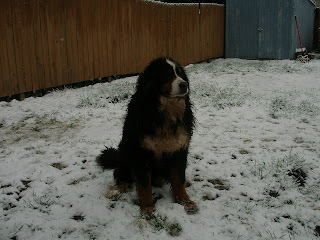 Up here on the Mountain it snowed on the first day of spring! 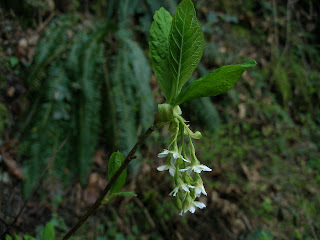 I was so delighted to see several other medicinals in bloom when I made a trip down to the Gorge. Trillium, violets, baby monkey flower, bleeding heart to name a few. There was also an abundance of early spring nettle, Dock, cow parsnip, wood sorrel, horsetail and other wonderful plants all poking through the ground. I will be writing about all of these soon in upcoming blog posts. Please forward and tell all of your friends! We invite and welcome your participation in any of the following workshops and gatherings, held in a magnificent river canyon and ancient place of power, deep in the mountains of the enchanted Southwest… 5 hrs. from the Tucson airport, or 4.5 hrs. south of Albuquerque. A six day event for women only, with a focus on primitive camping, interaction with the natural world and personal rewilding: learning to trust our senses, instincts and needs – and to heed our callings and live our dreams regardless of constraints, norms, fears and habits. Another six day women’s event, a memory-making celebration of the spirit of womanhood, dedicated to self nourishment, sisterly sharing and sweet savoring – with inspiring teaching circles, wonderful outdoor feasts, swimming, singing and riverside dancing! For men as well as women, a four day long workshop imparting insights and techniques for heightening awareness, connecting with inspirited nature, exploring alternate realities, instigating ecstatic states, developing our powers to affect events, and defining and fulfilling our individual most-meaningful purpose. Six days of presentations and discussions, plant walks and medicine making – for women who feel called to a healer’s life of intense awareness and personal responsibility. The Medicine Woman Tradition defines healing as contributing to wholeness and balance… of our selves, of others, and of the living world we are a part of. Four days of learning to identify, gather, preserve and deliciously prepare a wide number of the wild native foods of the mountainous West and Southwest – increasing observation skills, self confidence and our ability to survive, while helping us connect deeper to the natural world and cycles of life that we are each a natural part of. Anima Center also offers Retreats with meals in riverside cabins, Vision Quests, personal Counsel, resident Internships and Apprenticeships, and empowering Correspondence Courses including the Way Of Heart, Shaman and Medicine Woman paths. There is no set charge for any of the various opportunities, services, courses and events… only a suggested, sliding scale donation. You can make your own baby wipes solution! I use a strong tea or infusion & add some herbal oil to distilled water. There are a lot of herbs that are good for your babies skin, you can use chickweed (picture above growing right now in early spring! 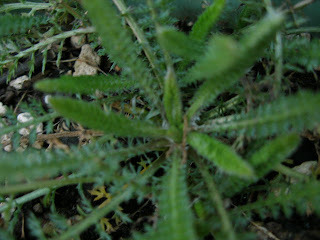 ), chamomile, comfrey, calendula, and many others. Plantain & chickweed are common weeds found here in the pacific Northwest, I am using this infusion for my babies wipe water right now because I have a lot of the herb on hand, when my calendula blooms I will be using that as well. I also add some oil to the solution (about 1/8 cup to a few cups distilled water/ infusion), almond oil, sesame or olive oil can be used, if you want to get real fancy you can even add a little vitamin E & /or jojoba oil. Some people like to add a little vinegar, a few drops of essential oil, and/or baby soap. I don't use the soap or essential oil because my daughter has sensitive skin and I do not want the residue or irritation. After you make your solution you can store a few wipes in the solution, beware they could mold if you keep to many in wipe water for too long. You can use a squirter bottle or spray bottle with your solution in it, spray on each dry wipe as needed, this will prevent your wipes from turning moldy. The solution should last at least a few days. You can make your own infused oil and add this to your distilled wipe water. One way to make your oil is to determine the herbs you want to use. You can simply loosely fill a mason jar with your herbs and cover with the oil/s. Store a room temp out of direct sunlight for 1 or 2 weeks. (Be aware that more delicate plants like chickweed can spoil faster than other herbs) Strain your herbs and store in a cool dark place, most will keep for at least a year, if they start smelling funky it means they are rancid, discard and make a new batch. Another alternative is to use a crock pot or double boiler (this is especially good for roots), infuse your herbs for a few hours (or longer) on medium heat, if you are using a double boiler make sure the water on the bottom does not evaporate while you are infusing your herbs. What to use for Cloth wipes? I take recycling one step further, for my wipes instead of buying the baby wash cloths or purchasing other types of cloth wipes I use some old sweat pants that were thin (softer than the wash cloths!) One pair of sweats cut up equal quite a few good sized wipes! 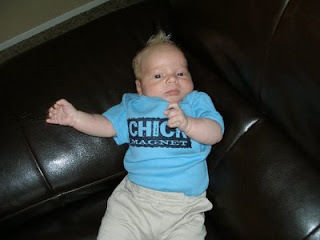 You can also use older cloth diapers cut into smaller squares. Some suggest using paper towels, I am trying to cut back on waist, help the environment & as an added bonus- save money- so I use cloth. I discard my wipes in the same bucket as the cloth diapers and wash them all in the same load. Although not a local herb, I received some arrowroot powder from a friend. Sometimes it is nice to trade and barter! I have been using this occasionally on Ella's bum and it has been working nicely. I have been looking up some other powders and see that some add a little white clay, other powders and essential oils, I have not tried this on Ella because I avoid the oils. Here are some alternative recipes. Avoid Talc based powders! It is good to apply the powder to a "power puff" first before applying to babies bum vrs just sprinkling out from the container, so the powder does not get into the air for the baby to inhale. 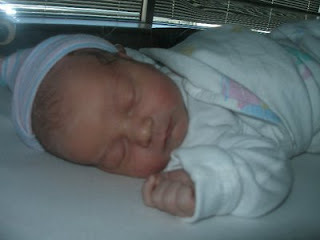 About Creams / Salves and Cloth Diapers. You may have heard about some studies suggesting that the additives in some baby soaps/ creams etc may be unhealthy for your baby. Why not make your own! You really don't want to use any cream or salve that has a fish oil base such as A&E or Desitin when using cloth diapers. You will get this fishy smell that you will never get out of your diapers! Of course you can make your own salve with the oils I mention above, just add a little beez wax to thicken over heat, here is a video that will walk you through the process. Another solution, let your baby go naked! Ella loves it, she runs around like a wild child! Good for infants too, provided they are warm enough of course. 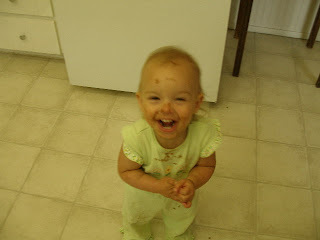 It works for some to keep a thick layer of salve on and frequently change (especially change poopy pants right away!) Also consider food sensitivities, dairy, wheat, citrus, soy, even garlic are common causes. Mom's make sure you are aware that the food you eat will pass through the breast milk, really read labels if you are eating preserved food, eliminate the above mentioned food that may be causing a reaction from your diet. 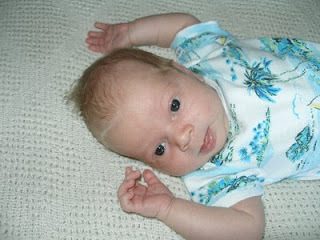 If you are formula feeding you may want to consider a different formula if your child has frequent rashes. More on food sensitivities. If you are using disposable diapers, some babies are sensitive to the chemicals in some commercial brands, 7th generation makes a safer disposable. Be aware of the detergents you are using; additives can cause rashes. Also, if you are making your own &/ or buying baby salve with additives or essential oils, this residue can stay on your cloth diapers even after washing, this could cause a reaction. Some of you may have read my previous post "There is no Official Certification of herbalist in the US"
In that post I list several resources you can use to practice herbalism. Herb Mentor is packed with great videos, articles and resources. I am so excited about Herb Mentor I wanted to discuss the site in a separate post so no one misses the new launch they have coming March 20th. 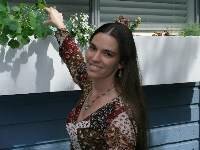 On the launch day herb mentor is offering a free tele seminar with Rosemary Gladstar at 5:30 Pacific 8:30 central time! In todays video about chickweed John Gallagher talks a little bit about the details of what being a member of herb mentor is all about, the costs (extremely reasonable by the way!) etc. and many other great instructional videos too many to list! One of the many things I like about Herb Mentor is that they keep things simple and accessible for everyone! There is no need to be overwhelmed you can learn at your own pace. They are basically bringing village herbalism right into your home via the web. Southern herbalist Phyllis Light and northern herbalist Matthew Wood discuss the advantages and differences of herbal teas and tinctures, Southern Herbal Traditions, Thin Blood Thick Blood et. 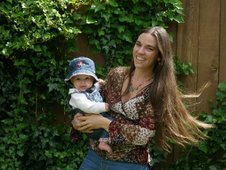 Herbalist Jackie Nikolaus has a strawberry love story to share with you from herbalist David Winston & More! Simple Pleasures! I am one of the few people I know that gets excited when the "weeds" start to pop up in the yard. Yarrow and Catnip (left). Dandelion is also starting to produce fresh leaves, there was just a few for my salad. I noticed my lemon balm plant is begining to show it's new leaves as well, I can't wait to try the Lemon Balm (herb of the year 2007) elixir Kiva suggested! 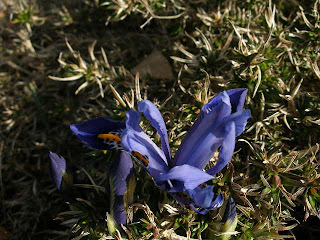 When I went out to check the mail I noticed this Oregon Wild Iris is growing right by my mail box. Signs of spring are here!